Atlanta likely does not make the Top 10 when one thinks about the greenest cities in the US. 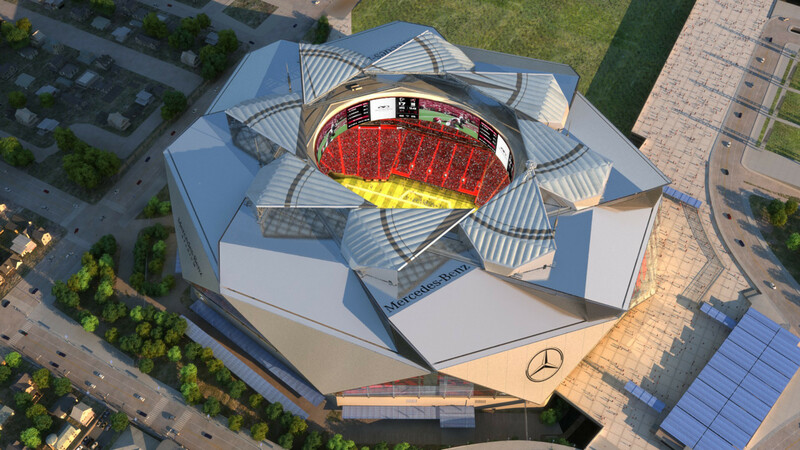 That may well change once new Mercedes-Benz Stadium, the stunning new techno- and sustainability-forward home of the NFL’s Atlanta Falcons and MLS’ Atlanta United, opens in 2017. GreenSportsBlog recently talked with Scott Jenkins, the stadium’s General Manager, about its greenness and what that means for Atlanta and beyond. Scott Jenkins has practically lived at the intersection of Green + Sports for the the past decade. He helped create the Philadelphia Eagles “Go Green” program in 2004 and then went on to become VP of Ballpark Operations of Safeco Field, home of the Seattle Mariners, in 2006. Under his direction, Safeco Field became one of the early adapters of greener stadium operations. In 2010, Jenkins helped launch the Green Sports Alliance, alongside Dr. Allen Hershkowitz, then of the Natural Resources Defense Council (NRDC) and now the Alliance’s President. 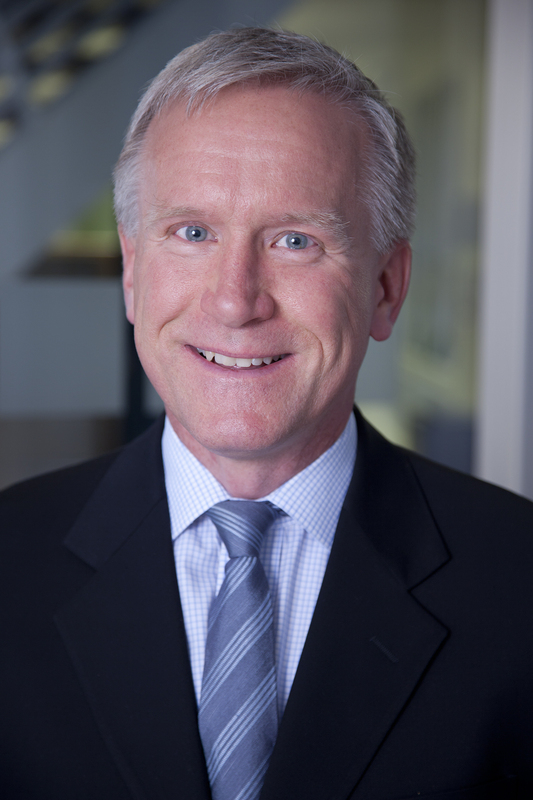 Jenkins has served as Board Chair of the Alliance since 2011. So it was no surprise to GreenSportsBlog that, when Arthur Blank, owner of the Atlanta Falcons and expansion Atlanta United of MLS, looked for someone to manage the building of a new downtown stadium that will push the envelope of sustainable operations, he chose Scott Jenkins. On-site Renewables: There are solar panels on top of the garage nearest the stadium that will, among other things, power the charging stations that provide juice for EVs parked below. Green Space: The Georgia Dome, the Falcons’ current home, will be demolished. In its place will be new grassy areas for parking. In its place will be open space for tailgating and non-game day community use. Rainwater Collection: Rainwater that falls on the roof and site will be collected and will be for irrigation and make up water for the cooling towers. HVAC: High efficiency condensing boilers will provide heating and high efficiency chillers will reduce cooling costs. Food: Farm-to-table and organic offerings will be available throughout the building. Landscape features include on-site edible gardens. Mass Transit: The stadium will be served by 2 MARTA light rail stops. 25% of attendees take MARTA to the Georgia Dome now—one of the highest rates in the NFL. And, when Atlanta United opens play in spring 2017, the expectation is that the younger MLS crowd will use mass transit at even higher levels. Green-Sports 101: The green basics will be covered, from recycling to composting; from waterless urinals to bike racks. 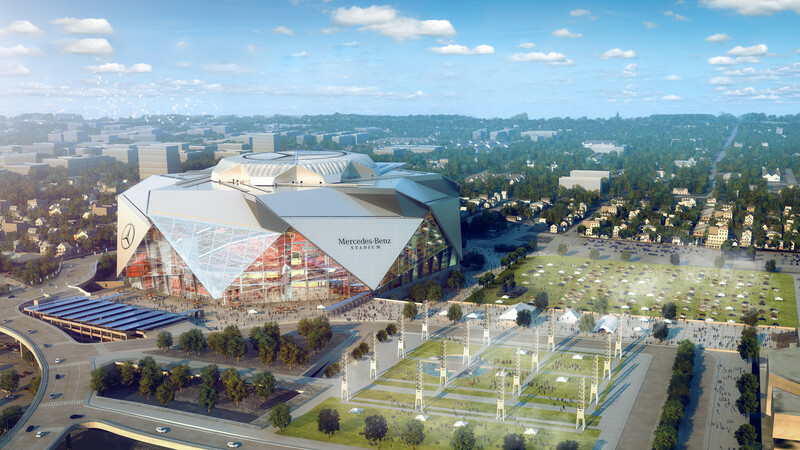 The revitalization of the Westside and the addition of a beautiful green stadium in a thriving downtown district makes for a great local Atlanta story. But know this: That story will reach a national audience as Mercedes-Benz Stadium plays host to the 2018 College Football National Championship Game and the 2020 Men’s Basketball Final Four. That audience will become global once a Super Bowl is granted to the stadium, something that will no doubt be in the offing.